Two of Big Joe's classic rockin' R&B CLUB JIVERS!!! 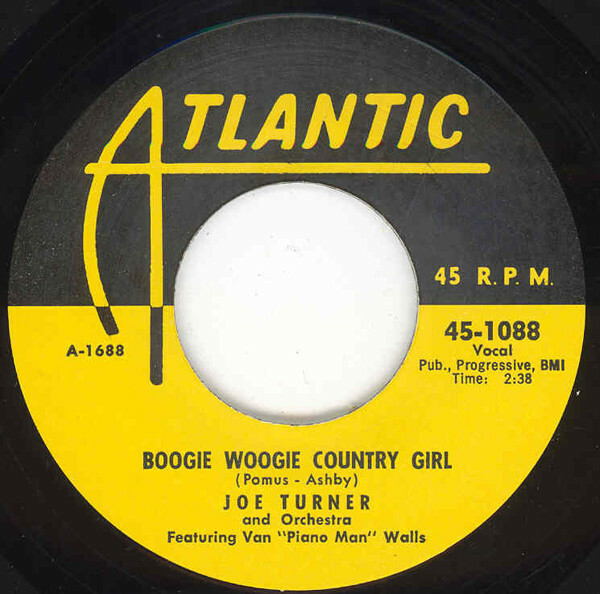 Leather-lunged blues shouter Big Joe Turner commenced a full-frontal career renaissance upon signing with Atlantic in 1951. Turner got in the habit of recording on the road, and on October 7, 1953, he happened to be in Chicago cutting the ribald TV Mama with none other than Elmore James on pungent slide guitar. The ad hoc Blues Kings also incorporated pianist Johnny Jones, bassist Jimmy Richardson, drummer Red Saunders, and three horns. Joe composed the #6 R&B hit but copyrighted it under his wife's name. 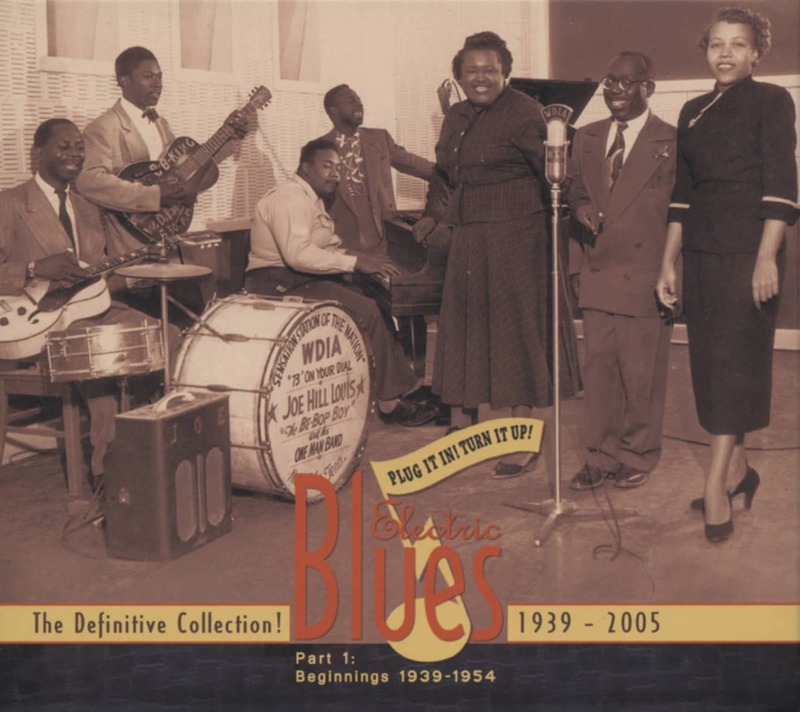 The school of Kansas City-style blues shouting begins with Big Joe. He was born there on May 18, 1911, his huge physique enabling him to slip into local gin joints in his teens to belt a hearty blues (his pipes were so powerful that a microphone was unnecessary). Turner formed a musical partnership with pianist Pete Johnson (Joe sometimes doubled as a bouncer or bartender at the same clubs), their fame spread, and in 1936 John Hammond caught their act at the Sunset, one of K.C. 's swingingest joints. He invited the pair to co-star at his fabled 'Spirituals To Swing' concert at Carnegie Hall in December of '38, leading to their first sides for Vocalion the next year and a long-term gig (and with fellow 88s pounders Albert Ammons and Meade Lux Lewis, the start of the boogie-woogie craze) at Barney Josephson's Café Society in Greenwich Village. Though he made fine postwar sides for National (My Gal's A Jockey was a '46 hit), Freedom (ditto Still In The Dark in '50), and a host of other firms big and small, Big Joe had fallen out of commercial favor and was working as Count Basie's vocalist when Ahmet Ertegun rescued him by dangling an Atlantic pact in 1951. Turner hit right out of the box with Ertegun's Chains Of Love, then The Chill Is On and Sweet Sixteen. He was in New Orleans when he cut his jumping '53 smash Honey Hush; next up was his jaunt to Chicago, supervised by Ahmet and Jerry Wexler. Yet when Turner made his unlikely transformation into a pioneering rock 'n' roller with the epochal Shake, Rattle And Roll in 1954 and its follow-ups Flip, Flop And Fly and Corrine, Corrina , he was back recording at Atlantic's New York headquarters. In his 40s, Big Joe memorably appeared in one of the first quickie rock 'n' roll flicks, 'Shake, Rattle & Rock!,' and he kept on roaring to the end of the decade on Atlantic. The ensuing decades only vaguely diminished his rafter-rattling pipes. He died November 24, 1985 in L.A. Customer evaluation for "Chicken & The Hawk - Boogie Woogie C... 7inch, 45rpm"